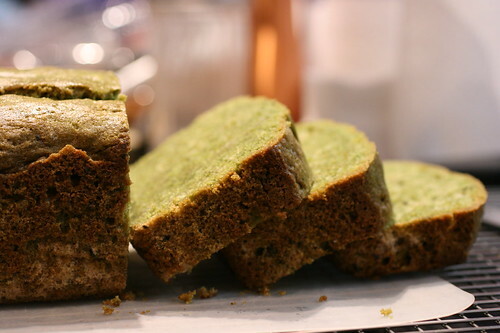 To follow up with my post on Maeda-en Matcha (Green Tea Powder), I used it today to make a Green Tea Pound Cake. Nick Malgieri’s recipe (from Perfect Cakes) calls for 2 tablespoons, roughly half of the $10 container. As opposed to the outstanding green tea ice cream, I don’t think the expensive green tea is worth it for pound cake. It doesn’t get to shine here. Don’t get me wrong; the pound cake is still a nice way to start your morning, but I think a cheaper green tea powder would do just fine. I will be testing some cheaper matcha powders soon. posted by jessica	at 10:44 PM	Filed under Un-Recipes. You can follow any responses to this entry through the RSS 2.0 feed. Both comments and pings are currently closed. I have always wanted to make a green tea dessert. This sounds like a great starter dessert (for me). Manger La Ville, I don’t think matcha is particularly hard to work with. JS, hmmm…2 sticks of butter vs 2 tablespoons of matcha powder?? I’m with you, it’s fine. Macha in desserts is my weakness! TS, I love it too…but I think a good green tea ice cream is my favorite way to have it. What about you?